The Scots are amazingly civil. The best example of this is their behavior on the street and on public transportation. 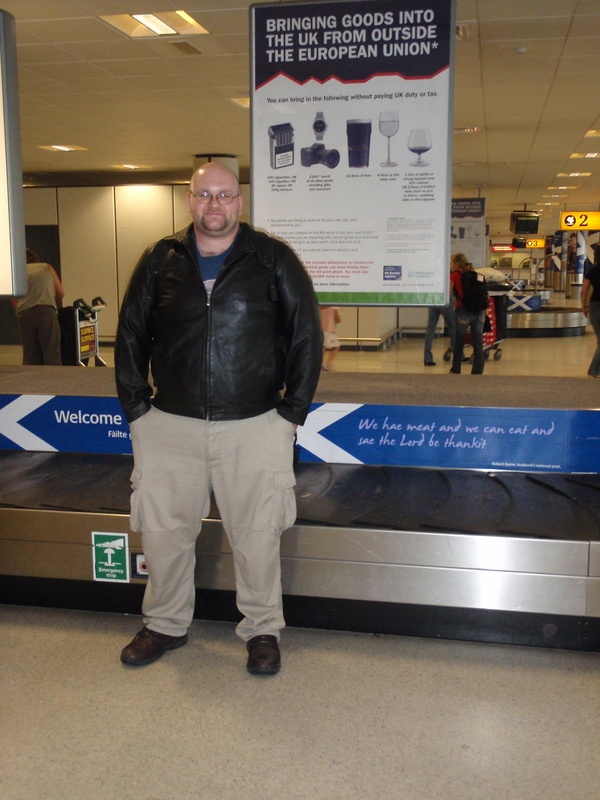 My son arriving in Edinburgh, in front of the Robbie Burns quote printed across the luggage carousel. I walk with a cane. A common problem is passersby kicking my cane out from under me because they aren’t aware there is something jutting out below their eye level. Also, not even in the so-called land of Southern hospitality can I depend on finding a seat on a crowded bus (except in Washington, D.C., the city I’ve found to have the most courteous commuters). Jostling for advantage at crosswalks, shoulder-butting, nudging the line forward with an “accidental” poke in the back, these are common incidents on American urban streets, right? I fear I’ve been guilty myself. Not once in Scotland was I jostled or butted. No one so much as touched my sleeve, even on Prince Street on the last night of the festival. The Scots watch out for each other and give each other plenty of room on narrow streets, at crosswalks, getting on and off busses, in lines—or “queues.” No surly teenagers or truculent commuters in the “priority seating for disabled” seats at the front of the bus, as I’ve sometimes found to be the case even in D.C. People deferred to me and to others even when I wasn’t properly queued, as in a last-minute arrival at the bus stop. Our landlady took us on a tour of the entire building when we rented her flat and also left us a binder of tourist information. When we passed her on the street on our way to breakfast late in our stay, she re-crossed the street to inquire if we’d encountered any problems or needed any more assistance. “Dour” Scots? Not in my experience. True, they were not, in my experience, effusive or particularly chatty. From their public transportation to their service in restaurants to their museum guides, they are efficient, busy, industrious, and cheerful. Reading about Joe Wilson’s outrageous challenge to the President’s speech, and Kanye West’s upstaging of Taylor Swift, and the heated health care debate, not to mention reading the Tea Party signs in The Scotsman, had a different slant from abroad. Photos, above: L) My son, Ansel, standing in front of the luggage carousel at Edinburgh Airport with a quote from Rabbie Burns (“We hae meet and we can eat, and sae the Lord be thankit.”) Below: My favorite bartender in my favorite pub, The Kenilworth on Rose Street. 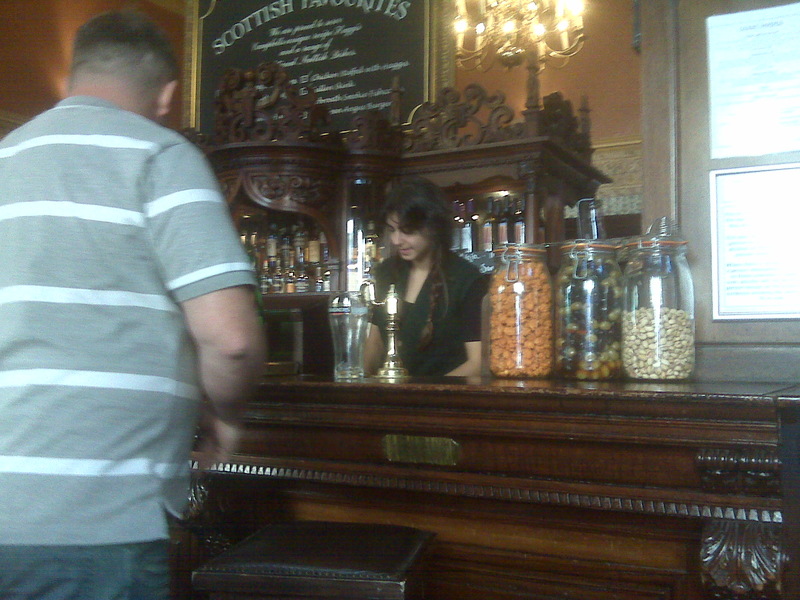 Pubs are a great contribution to the world. NEXT UP: Why I went, and what I learned, or, What’s a good Romani/Indian Girl doing in Scotland?